Displays the players and indicates who's turn it is. Click to open the player selector. Game stats for each player in the format: [# of darts : 3 dart average]. Click to display the full set of game stats. 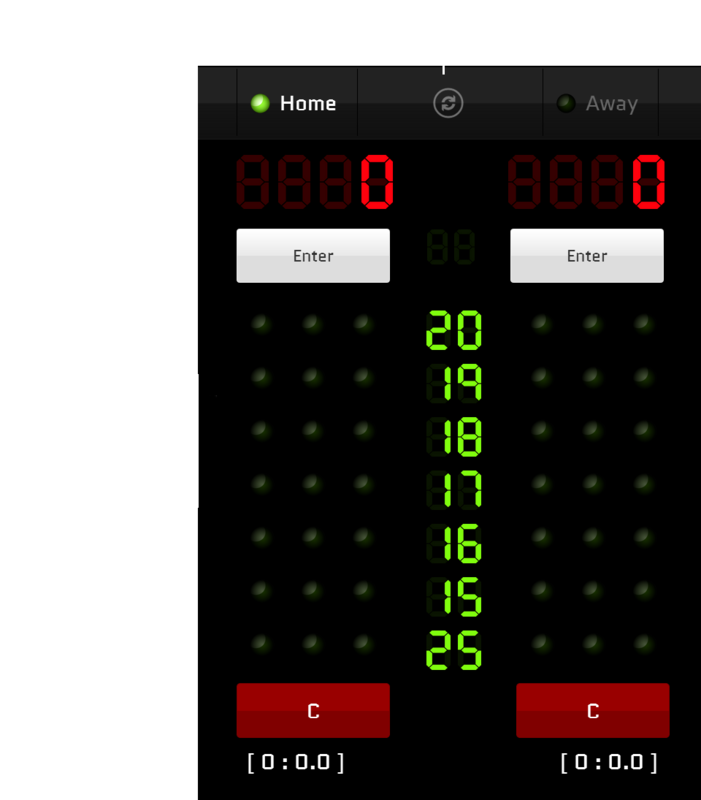 Click the Player Selector at the top of the scoreboard for the player you wish to change. A menu of the players to choose from will display. You can play against a Human Player or one of seven DartBot skill levels. Enter your final turn so that your display shows 0 points remaining. 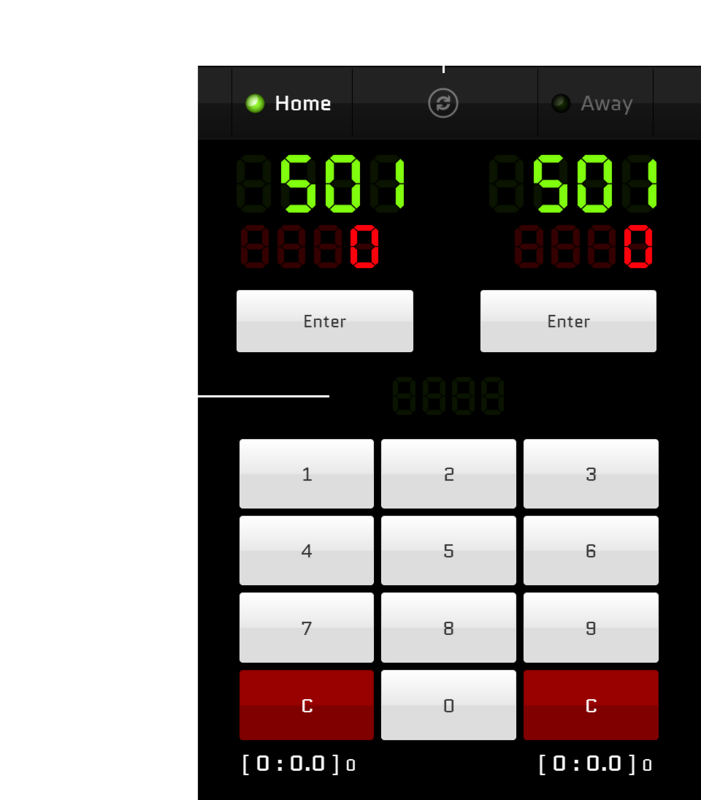 The stats area will show your point average and number of darts thrown for the game. If you didn't use all three darts you can now enter the winning dart using the number pad. If you finished the game on your first dart type 1 into the number pad and hit the enter button for the winning player. DartBot will adjust your game stats. Once you've finished the game hit the reset button to clear the scoreboard. You are now ready to start a new game. If you hit reset by accident you can restore your in-progress game by hitting either player's cancel button. Clear the previous game by clicking the reset button. Enter the starting points into the number pad. For instance to play 501 type 5 - 0 - 1 into the number pad. The value will show in the input display. Begin the game by hitting the enter button for the player who should start first. Type the number of points scored for the turn into the number pad. The value will show in the input display. For instance if 85 was scored enter 8 - 5 into the number pad. Hit the enter button for the player's turn you wish to record. The score will be subtracted from the player's points and 3 darts will be marked as thrown. If you've entered the wrong score for a turn you can cancel it by hitting the cancel button for the appropriate player. There is no limit to the number of turns you can cancel. Continuing to hit the cancel button will cancel previous turns. If you have entered an incorrect score into the number pad but haven't hit enter yet you can clear it by hitting either player's cancel button to clear out the input display. Displays the players and indicates who's turn it is. Click to change player. Game stats for each player [# of darts : Marks per round]. Click to display the full set of game stats.